On Sunday 22nd of May, Ki Society Tochigi HQ hosted an Aikido training session for Universities in Japan at Tenshinkan Dojo. This joint Aikido training session is held annually for the purpose of University Aikido groups to come socialize and train together. Aikido Groups from schools in the Tokyo Metropolitan area: Keio University, International Christian University, Tokyo Metropolitan University, Tokyo Institute of Technology, Nihon University and Waseda University took part in this training session. Students from Furman University (South Carolina USA), who were already training and staying at Ki Society Tochigi HQ, joined in the training session as well. The total number of participants for the seminar was 110 including 15 students from Furman University. It was a great international exchange experience for all students. 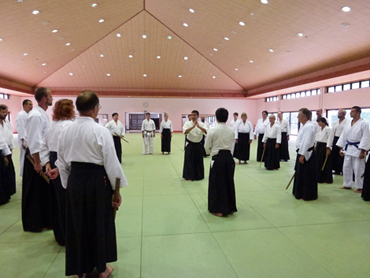 Furman University has a department which studies Oriental Philosophy, part of their studies program also includes Shinshin Toitsu Aikido, which is why their professor (Ph.D) decided to organize a training camp program at Ki Society Tochigi HQ. I, Tohei Shinichi, and HQ Instructors Otsuka Yutaka, Kataoka Taketoshi and Kobori Tomonori taught during the seminar. 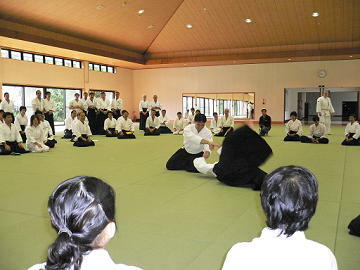 Students were able to practice care freely during the seminar in Tenshinkan Dojo (A dojo with 520 Tatami). After the training session, there was a party for all students to gather together and socialize. Training Camp sessions for Inter Universities in previous years were taught over 2 days, however from this year we decided to have 1 day of training seminar. Next year’s training session has been decided with same schedule. Ki Forum 2016 was held on February 11, 2016 in Arcadia Ichigaya (Tokyo). 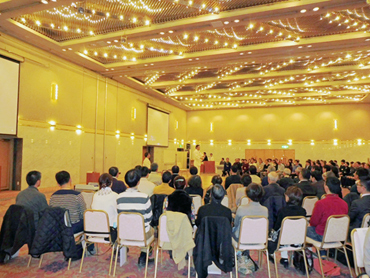 Around 160 participants from all over Japan came to attend the seminar. Ki Forum an event that is held only once a year, covers topics that are the basics of Shinshin Toitsu Aikido – Ki Principles: Mind moves Body, and how to apply these principles in our daily lives. Every year, we invite guest speakers who are at the fore front of their chosen careers and are members that practice Shinshin Toitsu Aikido to come and share with us their experiences and how they apply Ki Principles in their daily lives. This year, we invited MMA fighter Minowa Ikuhisa (Minowaman) to speak on the theme of: Shinshin Toitsu Aikido in daily life. During the first half of the seminar, basic topics such as – Posture (with mind and body coordinated), Keeping One Point, The Conscious and Sub- Conscious Mind were covered with participants through easy to understand applications. During the second half of the seminar, I held a Talk Session with Minowa San. During the talk session with Minowa San, we talked about his practice of Shinshin Toitsu Aikido and what he feels he learns and achieves from these classes as he applies it to his daily life, methods and ways of how he applies what he learns in classes to his daily life were the main topics and questions covered during the talk session. 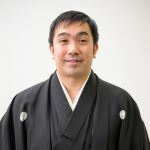 Minowa San’s interesting way of relating his training methods in daily life as well as his examples and actions of how he applies what he learns into his daily life, captivated and drew laughter and excited responses from the participants. After the Ki Forum Seminar, many participants who have been training and practicing Shinshin Toitsu Aikido and Ki principles gave me the impression that they felt they did not put in enough effort and practice of what they learn during classes into their daily lives, especially after listening to how Minowa San - a top athlete, trains and tries to apply what he learns from classes to his daily life and his attitude of valuing what he learns and taking it seriously. They all felt motivated and were going to continue their training in classes as well as during daily life. Next year, we will hold Ki Forum 2017 – participants who were unable to come this time, we look forward to seeing you next year. Below is a link for a video on YouTube for Minowa Ikuhisa (Minowaman) and some highlights of his fights as an MMA fighter. We have celebrated and welcomed in the New Year. I wonder how the New Year has been and what this year will bring for everyone. On January 10 (Sunday) 2016, HQ held the annual Kagami Biraki at Ki Society HQ Tochigi. 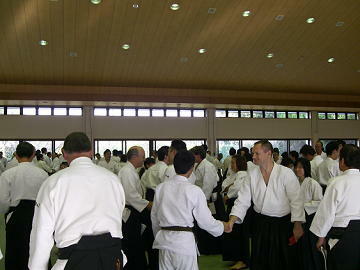 Kagami Biraki is one of the most important event and seminars of Shinshin Toitsu Aikidokai. Instructors and members from all over Japan, came together to participate in this event. There were a total of 93 participants this year. Early in the morning with temperatures of -1 degrees, participants started with Senshin no Gyo (a practice of pouring water on oneself), followed with Sokushin no Gyo (a practice of swinging the bell and breathing out in one breath at the same time.) The Dan Recommendations for 2016 was also formally announced, after which I taught the first Aikido training session for 2016. All seminars and camps for 2016 officially starts for Shinshin Toitsu Aikidokai. We look forward to meeting and practicing with all members again this year, Yoroshiku Onegai Itashimasu. HKF Camp 2015 was held at Ki Society HQ Japan (Tochigi) from August 31(Monday) till September 3rd (Friday) 2015. HKF stands for Hawaii Ki Federation, which is a branch federation of Shinshin Toitsu Aikido Kai in Hawaii, USA. During this camp, branch Dojos from Germany, Netherlands, Spain as well as USA came and practiced together. Due to many participants coming for World Camp which has been held annually at HQ, we decided that from this year we would hold smaller seminars for branch Dojos, Societies and Federations, so that I could teach and interact with every member that came for the seminar. For HKF Camp, 60 members in total including HQ members and instructors came and participated in the training. The themes covered and taught during this camp were: (Ki is always extending and exchanging), (Ken and Hanmi), (Hanmi with Wazas) – Having No Openings with Aikido Techniques, (Irimi and Tengkan), (Kokyu with Dosa) – Relationship between Breathing and Movements, (Ki Breathing), (Ki Meditation) and (Kiatsu). During the 4 days of practicing together at Seminars and having Gatherings after classes, we were able to spend a lot of time together with all members. We sincerely would like to thank Chief Instructor Christopher Curtis Sensei and all members for their efforts in helping to make this seminar a success. We have also decided to hold this seminar during the same time again next year, HKF Camp 2016. We will be having more seminars at HQ soon with members from other branch Dojos, Societies and Federations. With these Seminars coming up, I am looking forward to teaching and meeting all members and hopefully being able to instruct each member personally. As I was formally requested by LA Dodgers, I went to teach the players of LA Dodgers in the Dodger Stadium from 11th January 2010 (Monday) to 20th January 2010 (Wednesday). 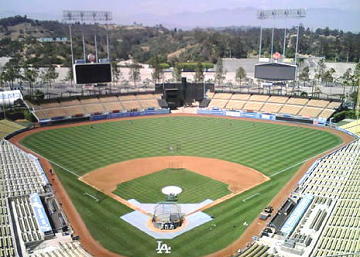 Dodger Stadium is the baseball stadium where the final game of the 2009 World Baseball Classic was held. It is historical and very beautiful stadium. In the original plan, Mr. Tatsuro Hirooka, a baseball commentator, was supposed to come with me, however, due to certain reasons, his attendance to the camp was cancelled so I went to teach without him. Fortunately, the teaching this time has finished with a great success and I have received highest appreciation from the players and coaches. It seems that the mind and body unification, which is the fundamental principle of Shin Shin Toitsu Aikido, will take root in LA Dodgers from now on. I sincerely appreciate Mr. Tatsuro Hirooka and those concerned with LA Dodgers, for having given such a great opportunity for me. Due to the agreement with LA Dodgers, I am afraid to inform you that the list of people who participated in my teaching, and the details of the teaching are strictly forbidden to be disclosed. This year the Keio University Ki-Aikido Club celebrated its 50th anniversary. 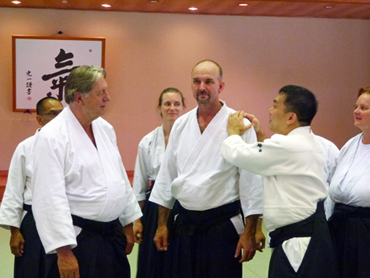 I am the instructor for the Keio University Ki-Aikido Club and therefore, as a part of this anniversary celebration, I taught a three day seminar from September 1 to September 3 in Maui, Hawaii. The seminar was attended by forty five members of the Keio University Ki-Aikido Club and their coaches, as well as over fifty members of the Hawaii Ki Federation, our host for this seminar. The seminar took place near the Shunshinkan Dojo (head dojo of Hawaii Ki Federation), and a large gathering for Sunday’s Sokushin no gyo took place in the Shunshinkan dojo itself. 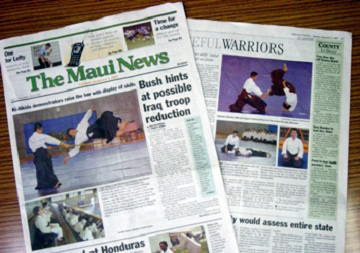 There has always been a strong bond between Keio University Ki-Aikido Club and Hawaii. When Koichi Tohei Sensei taught in Hawaii many years ago, some of club members often went to Hawaii with Tohei Sensei and practiced Ki-Aikido with Hawaiian members. Therefore the Hawaii Ki Federation was our host, and they took care of us very well. I really appreciate the hospitality of all members of Hawaii Ki Federation. The main theme of this seminar was “Communication with Ki”. If you ignore the mind of others and disturb them, they will resist automatically. In this way it is impossible to lead others. However, if you respect the mind of others and help them, they will follow naturally. In this way you will be able to lead others. We practiced this state of mind through Kokyu-dosa, Kokyu-nage, Nikyo, Kote-oroshi and many other techniques. But it is useless if you can do this only during practice. In order to learn how to apply this state of mind in our daily life, I taught how to lead others. Shinichi Suzuki sensei is a Maui resident, and major senior advisor to Hawaii Ki Federation. 54 years ago, he became Koichi Tohei sensei’s student when Tohei sensei went to Hawaii to teach Ki-Aikido for the first time. Suzuki sensei is now 90 years old but he is still teaching and brings up students. Keio members met Suzuki sensei and they were impressed with Suzuki sensei’s personal attributes. They learned a lot from Suzuki sensei. Many people worked hard to help us present this seminar. I really appreciate their help from the heart. Thanks to all of you, Koichi Tohei Sensei is doing very well. He teaches instructors of H.Q. everyday. I will do my best to learn Koichi Tohei Sensei’s principles and teach them correctly to all students. We begin each year with a ceremony praying for success in our practice (“Shugyo Tassei Kiganshiki” - in Japanese). This sincere and solemn occasion takes place on January 3rd each year. Before this ceremony, we do “Senshin no gyo” where water is poured over oneself in the early morning in order to purge one's heart and purify oneself. The idea of pouring icy water over onself at the coldest moment in the early morning in the winter may seem a very tough practice. However, if you calm your mind in the lower abdomen, and and maintain this state, you can enjoy this practice very much. In this way, you definitely can experience how to use your mind. Usually, at this time of year, the air temperature is about -8 degrees C and water temperature -4 degrees C. However, this year’s air temperature was 2 degrees C and water temperature was 10 degrees C. It was like a paradise! It must have been quite an experience for those participants who did this practice for the first time. During the follow-up ceremony of praying for success in practice (“Shugyo Tassei Kiganshiki” in Japanese), first, I performed Ki-Barai. 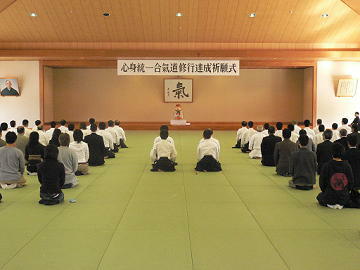 Then, I prayed for the success of Ki-Aikido practice and safe practice for all students all over the world. 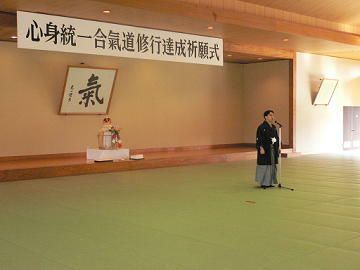 And I gave a New Year speech in which I talked about the action policy of Ki-Aikido this year. After this, the Instructor of H.Q. Yutaka Otsuka (Ki-Aikido 9th dan) and Taketoshi Kataoka (Ki-Aikido 8th dan) performed Ki-Aikido in dedication to the Universe. The last part of the ceremony was the announcement of Dan promotions. I gave certificates to each student who was promoted. We present only certificates of high rank at this ceremony. In Ki no Kenkyukai, we promote Ki for health and Ki for education. However, the basis of those is Ki-Aikido. I would like to place more emphasis on Ki-Aikido more this year. I will do more seminars in Japan and overseas than usual. I will have “Ki Forum 2007” seminar on February 12, 2007. 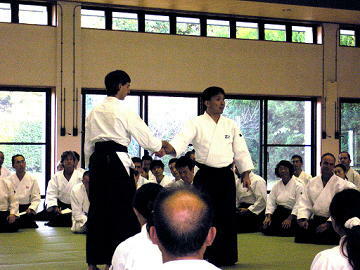 The main theme is “Ki-Aikido (Shin-shin Toitsu Aikido)”. Let’s practice together this year. World Camp 2006 was held at Ki no sato (Ki Society H.Q.) from October 25th (Wednesday) to 29th (Sunday). It was a five day seminar. I, Otsuka sensei, Kataoka sensei, and Sawai sensei, who are instructors of Headquarters, taught the seminar. About 60 students attended; mainly instructors. Those attending were from the US, Russia, Australia and Europe. In addition to World Camp, we had a Japanese Instructors’ seminar on the weekend, adding 70 more to World Camp, making a total of 130 people practicing together in total. Koichi Tohei Sensei came to the very first class of the World Camp. He took the opportunity to shake hands with each participant. The main practice place was the Tenshinkan Dojo. There are 520 tatami mats in this dojo. Because the dojo was so filled with participants, we felt we had no room to swing a cat when we practiced Ki-Aikido! Because all of the overseas members sacrifice their precious time, pay travel fees, seminar and accommodation fees, they tried to take in every word and not miss a thing. I was very touched by their earnest attitude. Ki-Aikido school institute students also attended the world camp. They were also impressed by the overseas students’ earnest attitude. We taught Ki principles (Mind moves body), posture with oneness of mind and body (posture with natural stability), Ki-Aikido techniques, Kengi, Jogi, Ki breathing, Kiatsu therapy and Oneness Rhythm Exercise. After the seminar, participants returned home with full smiles. When we saw this, all the instructors of H.Q., staff and I had a very happy feeling. I would like to share with you the contents of the seminar, however, the volume is so large that I am sorry I cannot include it all on my weblog. We will hold World camp once a year. If you are interested in World camp, please join us next year! 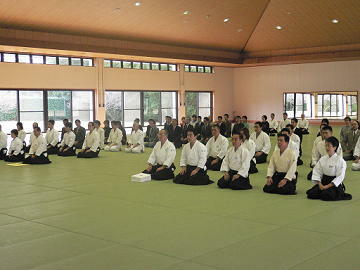 The All Japan Ki-Aikido Taigi Competition was held at Ki no Kenkyukai Headquarters last month. The purpose of this competition is not to compete with each other relative to technique. The purpose of this competition is demonstrate your oneness of mind and body which you have learned in your dojo and your daily life. 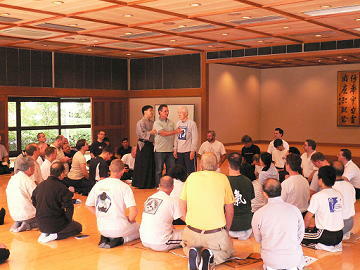 The judges watch participants’ state of mind and body oneness in every movement, not only each technique, but even when they are bowing, walking, and also their ma-ai (proper distance). Therefore, I will tell you how best to watch this. There are three points to watch for; “Balance”, “Rhythm” and “Largeness”. Balance means the posture with oneness of mind and body. If you try to throw your partner forcefully, you will be tense and off-balance. Your body wavers up and down, and right and left in your movement. However, if you calm your mind in one point in the lower abdomen and move from one point, your posture becomes stable without wavering no matter how strongly or quickly you move. If you see Ki-Aikido techniques performed with oneness of mind and body, they are very beautiful. That’s when Ki-Aikido technique truly works. By watching only posture, you will understand the participant’s depth of understanding about oneness of mind and body. Rhythm means “natural rhythm” as the word suggests. If you try to throw your partner forcefully, your rhythm becomes too busy. On the other hand, if you lose power, your rhythm becomes too slow and with no Ki. Movement with oneness of mind and body always has natural rhythm. No matter how strongly or quickly you move, the rhythm will never be disturbed. That’s when Ki-Aikido technique truly works. By watching only the rhythm of the participants, you will understand their depth of understanding about oneness of mind and body. Largeness means “largeness or fullness of the extension of Ki”, as the word implies. When a master acts on the stage, the master looks very big. In this same way, when participants extend Ki, their performance looks very large. However, if your mind is clinging to the idea of trying to perform well, then you will pull your Ki and your performance will look small. When your movement looks relaxed and large, your techniques work. By watching only the largeness of the participants’ movement, you will understand the depth of understanding of oneness of mind and body. If you watch the taigi competition based on these three points, you will understand the depth of understanding of oneness of mind and body well, even if you are beginner. Performance of the participants will be judged on a scale of one to ten. Then, the level of quality will be decided. You will learn a lot if you draw a comparison between your own sense of success, and the level at which the judges placed you. The competition will be held next summer also. If you have time, please visit the competition next year. If you have been studying Ki-Aikido, or if you might like to begin, it may be useful for us to check the purpose and basic concept of this practice. Koichi Tohei sensei tells us that the most important aspect of this practice is to control our mind and body. Control of our mind and body is extremely important not only in Ki-Aikido but also in human relationships in our daily life. When we have problems, we may tend to try to find the cause outside of ourselves, instead of within, if we do not use careful consideration. We may have a habit of thinking “I’m not wrong but others are”. So we try to change others instead of ourselves. The result may be a backlash or conflict, and in addition we will have failed to lead others. First you must change yourself, if you really want to lead others. Sometimes I find myself that I try to change others. When I found this, I mend my behavior by myself. As this relates to techniques of Ki-Aikido, before thinking of trying to throw our partner, we first must check whether our mind and body are stable. Stability is condition of oneness of mind and body. Stability is achieved through self control. This means to maintain the condition of oneness of mind and body. If you have a positive, or plus, mind, your body necessarily becomes plus in concert with it. If you want to do techniques of Ki-Aikido correctly, you need this positive mind that we call “Ki is extending.” Once you get this “Ki is extending” mind, while practicing Ki-Aikido, it will become the foundation of all things in your daily life. We tend to have selfish minds that think only of our own selves. In Ki-Aikido techniques, that translates as, “I want to throw my partner” or “I want my partner to do as I wish.” Of course, in practicing Ki-Aikido, there is always a possibility that we will exhibit selfish mind. Unfortunately, in that state of mind, no one can do correct techniques. If we look at the “Five Principles of Ki-aikido”, as presented by Koichi Tohei sensei, and in so doing take note of and amend our own mistakes, we will be able to lead our partners. The repetition of the process of noticing and amending mistakes is what we call “Keiko” or “practice”. Let’s practice together based on the Five principles of Ki-Aikido.